Produktinformationen "HiTechnic NXT Touch Sensor Multiplexer"
Connect up to 4 standard NXT Touch Sensors to one sensor port with the Touch Sensor Multiplexer. 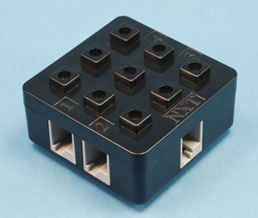 The HiTechnic Touch Sensor Multiplexer has 4 input ports where NXT Touch Sensors can be attached and a single output port to connect to the NXT. The state of each Touch Sensor can be read independently and a single read can determine the state of each touch sensor. Weiterführende Links zu "HiTechnic NXT Touch Sensor Multiplexer"
Garantie(Jahre) "HiTechnic NXT Touch Sensor Multiplexer"
Kundenbewertungen für "HiTechnic NXT Touch Sensor Multiplexer"